For our New Years Day dinner last night I made a new version of Hoppin’ John, keeping it vegan for a second year. The big change is I served it over baked barley, my first time to try that. The barley is very good tasting, great texture but wow does just a tiny bit fill you up! Rice might have been a better choice but the good thing is the HJ makes so much we have LO’s for lunch today I can serve with rice – yay! In a large/deep skillet, heat over medium-high heat and add the oil with the vegetables, let cook for about 10 minutes. Add in the garlic and cook for another minute. Add everything else, bring to a boil, then turn down to medium and let simmer for 40 minutes, loosely covered. If it is boiling too hard turn down a bit as needed. Taste for seasoning and add more as desired. Served over your favorite carb – see below for two methods. The Hoppin’ John serves about 6 to 8 people. Preheat the oven to 375°. Add everything to a 8×8″ glass baking dish, cover tightly with foil and bake for 1 hour. Heat the oven to 375°. Bring 2½ cups water to a boil, add it, 1 Tbsp extra virgin olive oil and 1½ cups long grain brown rice to 2 quart or 8×8″ glass baking pan, cover with foil tightly and bake for 1 hour. Makes about 4 cups baked. Update: For lunch we used the leftovers and made a very tasty repast! I drained the liquid from the LO’s into a large measuring cup to see how much I had, then transferred it all to a large skillet and brought it to a boil. I had a shy 2 cups liquid so I added 1¾ cups instant rice, stirred it in and then covered, turning off the burner. After letting it sit 10 minutes I sprinkled on about 1 cup 2% sharp cheddar cheese and let it melt, then stirred in. This served 3 of us for lunch – with big hearty bowls. Yum! 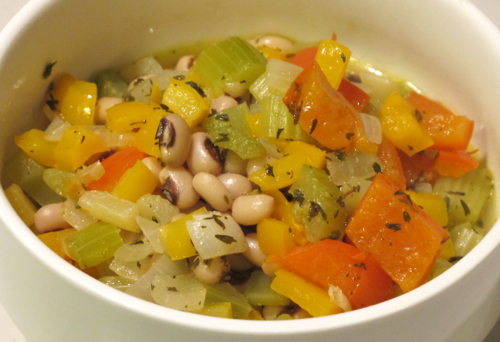 Oh, gosh, I totally forgot to make Hoppin’ John on New Year’s Day for good luck! I even saw that black eyed peas were on sale at the grocer’s yesterday and had thought, “That’s odd!” Thanks for the reminder. Maybe it’s not too late!! !